After a rained out edition, Giulio Green and the Murder crew didn’t wait a year to cook a part two. Vicenza’s (north east of Italy) concrete bowl was the home for riders of four different countries for three days of fun. It started Friday night with a practice session along with a nice bbq… italian style… they sure know how to live. It was a small glimpse of what was going to happen. Alessandro from Share magazine’s birthday may have had some relation to that… hahaha. I tip my hat to the strongest of the strong, who were around at 10 am to get everything ready for the contest – you guys are the best. DJ Lips started strong with some Deep Purple at 3 o’clock sharp to give the juniors the green light. The young generation are great and two riders were clearly above the crop: Alessandro Gonfiantini used the bowl like it should be, ollieing the hips with a lot of style and control, and finding a lot of lines. Winner Ale Mazzara displayed the cold blood of a veteran, nailing big air after big air with an incredible stamina for a nine year old. The senior contest followed with a tight schedule, six heats under a hot, hot sun. My personal highlights from the qualifications were Alessandro Ferreri’s sick aggressive surf style (layback on the clamshell), Il Baro’s astonishing fast lines, Oliver Gordon’s transfer over the peninsula and Icaro Nardi’s perfect first run ! The podium was Andrea Casassanta – lots of style, great stalefishes and frontside tailgrabs into third place. Swiss ripper Martino Cattaneo winner of the Vans Spring Classic had trouble to adjust to the size of the bowl, but got it together quickly with some handplant variations, gnarly backside ollies and a lot of creative lines, and a big smile on his face all day (remember kids: it’s supposed to be FUN) but that wasn’t enough to knock off Ivan Federico from first place… bearing an injured hip and stiff legs out of the plane from California’s pool party, Ivan managed to do a lot of air variations everywhere, a nasty tranfer head high over the fat part of the spine and his trademark kickflip melon. 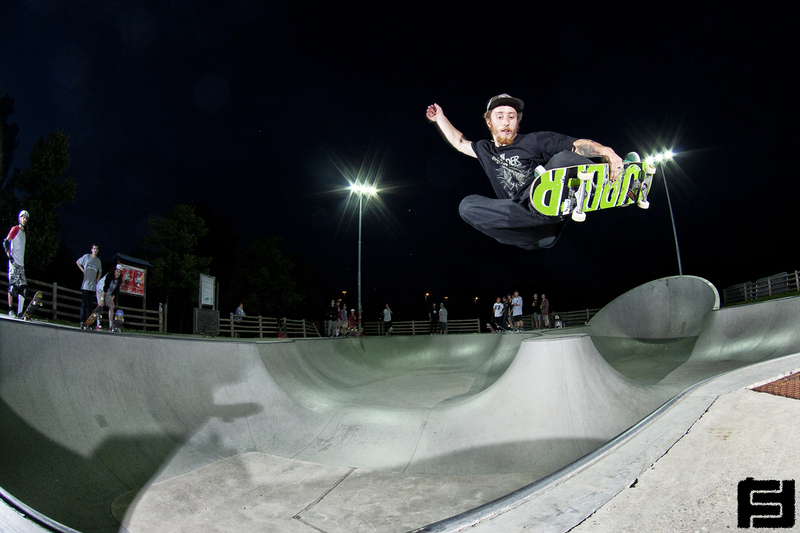 The best trick included a wall extension with a pool coping on one side of the bowl and a ladder on the other side. Martino went big on the wall: nose pick and disaster while Fabio Botelli did a SICK boneless on and off the ladder! WOW!! Bowlmania is a wrap – great friendship, slick organization, the perfect recipe for a contest!